1. Enter the title or search terms you are looking for in the search box on the UW Libraries homepage. 2. 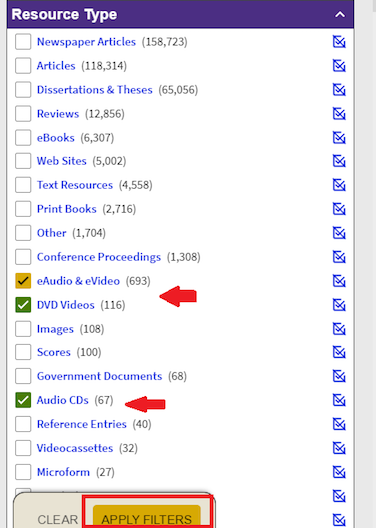 Filter your results by selecting a media (DVD Videos, Audio CDs, or eAudio & eVideo, etc.) from the Resource Type on the left (you may have to click on "Show More" to see all available Resource Types). This will narrow your results to your desired media type. 3. Click the box to the left of your desired media type(s) and click "Apply Filters". 1. Look for the "DVD Video" label (or "Audio CD" if you are looking for a CD). 2. To see more information, click on "Available at ". 3. This will open a window that allows you to "Get It" where you can request the item be delivered to a certain pick up point.